Dr. Tony Tran found his passion for health and fitness as a teenager in his hometown of Round Rock, Texas, where he played high school football. He continued with his love for fitness and academics at the University of Texas, where he received a Bachelor’s degree in Kinesiology and a minor in Biology. During his studies, he was a personal trainer at the UT recreational sports and Gold’s gym. 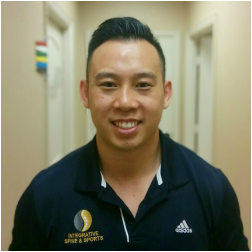 Soon after, Dr. Tran decided to pursue a Doctorate of Chiropractic degree in Houston, with an emphasis in Sports Rehabilitation. During his last year of clinicals, he had the honor of being selected to the Rice University athletic program, where he treated clients from several different sports. After finishing his studies, Dr. Tran developed the sports rehab program for several practices in the Austin and the Houston regions. His experience and knowledge has helped him develop trust and relationships with other medical professionals, gyms, and crossfits. Practicing chiropractic and healing patients naturally has been a dream come true for Dr. Tran. Today, he has opened multiple offices throughout the Houston region. He enjoys spending his free time with his family and newborn son.